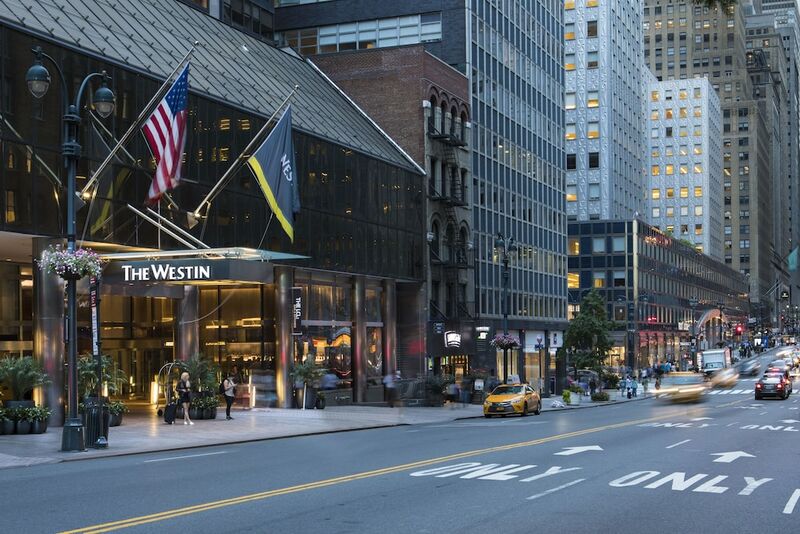 With a stay at The Westin New York Grand Central, you'll be centrally located in New York, just a 4-minute walk from Chrysler Building and 5 minutes by foot from Grand Central Terminal. This 4.5-star hotel is 0.4 mi (0.6 km) from 5th Avenue and 0.4 mi (0.6 km) from United Nations Headquarters. Make yourself at home in one of the 774 air-conditioned rooms featuring minibars and LCD televisions. Your pillowtop bed comes with down comforters and premium bedding. Digital programming provides entertainment, and wired and wireless Internet access is available for a surcharge. Private bathrooms with separate bathtubs and showers feature rainfall showerheads and complimentary toiletries. Take advantage of recreation opportunities such as a 24-hour fitness center, or other amenities including complimentary wireless Internet access and concierge services. Additional amenities at this hotel include babysitting/childcare, gift shops/newsstands, and a ballroom. Enjoy American cuisine at The LCL: Bar & Kitchen, a restaurant which features a bar, or stay in and take advantage of the room service (during limited hours). Continental breakfasts are available daily from 6:00 AM to 11 AM for a fee. Featured amenities include a 24-hour business center, express check-in, and express check-out. This hotel has 16 meeting rooms available for events. The hotel offers a restaurant and a coffee shop/café. A bar/lounge is on site where guests can unwind with a drink. This 4.5-star property offers access to a 24-hour business center. A computer station is located on site and wireless Internet access is complimentary. 16 meeting rooms are available. This luxury hotel also offers a 24-hour fitness center, tour/ticket assistance, and gift shops/newsstands. Parking is available onsite for a surcharge. The Westin New York Grand Central is a smoke-free property. Continental breakfasts are available for a surcharge and are served each morning between 6:00 AM and 11 AM. The LCL: Bar & Kitchen - This restaurant specializes in American cuisine and serves breakfast, lunch, and dinner. Guests can enjoy drinks at the bar. Open daily. Recreational amenities at the hotel include a 24-hour fitness center. This property's policy is to refuse certain bookings for the purpose of group events or parties, including pre-wedding stag/bachelor and hen/bachelorette parties. The property has connecting/adjoining rooms, which are subject to availability and can be requested by contacting the property using the number on the booking confirmation. Guests can arrange to bring pets by contacting the property directly, using the contact information on the booking confirmation (surcharges apply and can be found in the Fees section). Book a stay in any room or rate plan and receive the following benefits (included with destination fee): USD 35 Food and Beverage credit per day; USD 20 dry cleaning credit per day; 1 New York City bus tour ticket for 2 or official Grand Central self-guided audio tour for 2; 1 yoga class at local studio per day; local, long-distance and international calls. Full details provided at check-in. Taxes and gratuity may not be included. No refunds for any unused portion of offer. Offer subject to availability. Offer is not valid with groups/conventions and may not be combined with other promotional offers. Other restrictions and blackout dates may apply.